During the Jim Crow era the African American community helped build Rosenwald schools across the South to ensure that their children received a quality education. Today, the legacy of these schools is fading from the memories as well as the landscape of our community. The buildings are on the list of America’s most endangered historical places. And yet, the Rosenwald Schools along with the teachers who led them are an important part of African American history. In the early 1900’s, it was clear that America was unwilling to invest in the education of African American children. In communities that provided schools, the buildings were dilapidated and many teachers had little education. Booker T. Washington recognized the urgent need to address this issue. He reached out to Julius Rosenwald, President of Sears, Roebuck and Company who had recently joined the Board of Trustees of Tuskegee Institute. Rosenwald agreed to fund a 6 small schools in Alabama. Eventually, the program was expanded and helped to finance almost 5,300 schools, shops and teacher’s homes in 15 states. In order to receive a grant, each community had to raise additional funds. The school board had to purchase the land as well as provide teachers with salaries and supervision. According to historian Joanne Abel, “The African American community was doubly taxed. Once for their regular taxes and then they provided additional funds as well as contributed labor and materials.” Recognizing the need for a quality education to improve the lives of their children, African Americans donated millions of dollars. To build the schools, communities were given blueprints and strict requirements for construction. Inspectors ensured that they met the standards. The schools were designed by a Tuskegee architect and were considered to be state of the art. In some cases the Rosenwald schools were so exceptional that the white communities took them over. 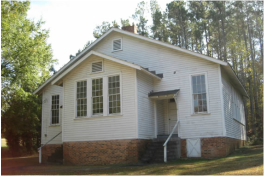 North Carolina had 800 Rosenwald schools, more than any other state in the country. This was primarily the result of the efforts of Dr. Aaron Moore, founder of Mutual Life Insurance, Lincoln Hospital and Mechanics and Farmers Bank. He spearheaded fundraising efforts and lobbied politicians, businessmen and educators. He even paid the salaries of the first Jeanes teacher in Durham and North Carolina’s first rural school inspector. Moore developed a fundraising pamphlet as well as a card that stated, “My message to you is to emphasize the importance of child training: without which all parental, civil and religious governments must fail”. He signed every letter with, “Yours in racial uplift”. At the end of segregation most Rosenwald schools were either abandoned or destroyed. Today, the National Trust for Historic Perseveration is striving to identify and document Rosenwald schools as well as promote their renovation. It is a major undertaking and just as the African American community worked together to build the schools, we must come together again to save them. This June, the City of Durham is hosting a national conference for the Rosenwald schools. There will be Rosenwald school exhibits at the Durham History Hub and the Durham County Library. To learn more about these events, to volunteer or to make a donation, go to www.africanamericanarts.org. There are some important insights that can be gained from the life of Cedric Walker, the Founder of the UniverSoul Circus. Here is just some of Walker’s wisdom. Walker learned from his friend that he should use his money to invest in his future. As Walker toured the world as a promoter, he saved his money and was eventually able to launch his own business. 2. When you give to others, you may be giving to yourself. Walker volunteered with the bands at his uncle’s club. That experience enabled him to gain technical knowledge and led to him becoming a promoter. 3. You can get by with a little help from your friends. When Walker was trying to develop an idea for family entertainment, he met quarterly with partners to brainstorm. The concept for a circus came from one those sessions. 4. Only the best will do, so do your best. Walker spends a significant amount of money and time to develop exceptional performers. His trainers come from around the world and are the best in the industry. 5. Don’t wait for an opportunity, create an opportunity. Walker realized that he would never achieve the level of success that he wanted unless he created events instead of just promoting them. That led to him developing the Fresh Fest tours that helped to launch the hip hop culture. 6. Those who can do. Those who can’t don’t. When Walker developed the Fresh Fest Tour and the UniverSoul Circus, many people told him that he was “nuts”. Still, Walker moved forward with his vision and achieved a level of success that his critics could only dream of. 7. Go where you are needed, and that may be exactly where you need to be. Although Walker didn’t want to go on another tour, he traveled with the play, “A Good Man Is Hard to Find” to help ensure its success. It was during that trip that he attended a cultural festival and met the historian who provided him with critical information that helped to launch his circus. 8. You don’t just need a good reputation, you need a solid one. During his time as a promoter, Walker developed a strong reputation. It helped him to gain support for the UniverSoul Circus. It was particularly critical during his difficult years. 9. Know your strengths to find your direction. Walker could have limited his focus to musical concerts but he realized that he wasn’t in the promotion business he was in the entertainment business. That knowledge helped him to venture out into new areas that built upon his strengths. 10. Follow the signs. They’ll lead you in the right direction. As Walker developed his idea for family entertainment, there were several signs that showed he was heading in the right direction. The first Black circus closed exactly one hundred years before Walker decided to open the UniverSoul Circus. When Walker was trying to develop his own circus, he just happened to stumble upon an African American circus historian. 11. Competition can be good or bad. You decide. Following the success of UniverSoul Circus, there now are Black circuses in Germany and Australia. The man who developed the German circus, stole half of Walker’s performers. Walker chose to look at the loss as an opportunity for growth and developed innovative new acts. Walker believes that a new competitor could ultimately help to expand the market and increase his own level of success. 12. Study the past, observe today and get ready for tomorrow. Walker went to the library and conducted extensive research into the African American entertainment industry and developed his idea for a Fresh Fest tour by attending several night clubs. Later he produced several plays which helped him realize that there was a need for African American family entertainment. 13. There’s no school, like an old school. 14. See your dream, hear your dream, speak your dream and live your dream. See: As Walker developed his concept, he posted pictures around his home and office so that he immersed himself in the circus. Hear: Walker spent time with an African American circus historian and the first Black lion tamer. They provided him with ideas and access to the circus community. Speak: Walker told everyone that he knew and met that he was working on the first black circus. It helped him generate ideas and inspiration. Live: Walker’s vision, focus and determination enabled him to create the UniverSoul circus. 15. Trust your instincts and put your faith in God. Cedric Walker was born to be an entrepreneur. He started a shoe-shine business at the age of six. While growing up, he was always selling something: frozen ice, Christmas cards, fruits and vegetables from a horse drawn cart. Walker was raised in a violent, drug invested neighborhood in Baltimore, MD. After he began to get into trouble, his father took him to Tuskegee, AL to live with his uncle. Soon after his arrival, Walker found an illegal club and spent most nights gambling. He said, “Even when I got there the street was still in me.” When Walker was 17, he had a job cutting grass. At the end of one day, he had earned $35. He told his friend that he was going to the crap house and “turn this money over.” Walker’s coworker told him that he was saving his money to start his own business and to purchase his own home. Learning about his friends’ vision and ambition changed the direction of Walker’s life. Walker began to notice that although hip hop music was extremely popular in clubs, it wasn’t being played on the radio. So he created the “Fresh Fest tour”, which was the first hip hop tour to play large coliseums nationwide. It featured artists including Run DMC, LL Cool J and the Fat Boys. When he conceived the idea, people told him that he couldn’t do a concert starring unknown rap artists and without a band. When investers backed out, Walker stayed true to his vision. “I believe in God. I believe that he operates within us and our work is a reflection of him. If we do our work in that spirit, then He will guide you. And it’s easy to follow that guide. You can’t listen to everyone around you. There is something about an idea that is very powerful. And you’ll know. There is no way to explain it but if it is a good idea you’ll know.” The Fresh Fest Tour was an enormous success. The concerts sold out every arena in 1984 and 1985. Walker went to the library and researched black entertainment from the turn of the century. Walker found that in late 1800’s there was an African American who created a circus that featured all black performers. According to Walker, “It was in 1894 when he lost his show and a hundred years later we came across it.” As with the Fresh Fest tour, investors balked at the concept of a black circus. “Everybody ran from the idea but I was so used to it by then” said Walker. While working on his concept, Walker went to an African American cultural event in New York and came across a booth with the sign “Africans and the Circus Rings”. Walker said, “I nearly flipped. I got tremors. I couldn’t believe it. The hair raised up on my skin. This man had every black performer that ever participated in the circus. The whole history of the Black artistry in the circus. I lost my mind.” Walker got a camera and with the historian’s approval took pictures of everything in the booth. The circus historian introduced Walker to the first Black lion tamer who knew other great circus performers. The word soon spread that Walker was building a Black circus. “All of these acts were so excited. They didn’t want money for travel. They just wanted to be there and be a part of it. The people in the industry were all very supportive. 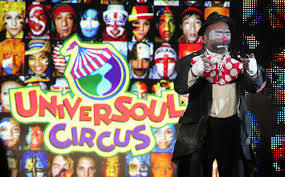 Everyone wanted it to happen.” The first UniverSoul Circus opened in Atlanta in 1994. Despite the industry excitement, the circus was not an immediate success. The first year the circus lost close to $500,000. In a typical show Walker gave away 90% of the tickets. Walker recognized that in order to build his audience, he would have to first allow people to experience the circus. Walker’s instincts told him that people would eventually pay to attend. “You have to understand that the stronger the tree, the deeper the roots. The size of the goal that you have to achieve determines what you have to do to achieve it. If you are going for something big you are going to have big problems trying to get there.” Each year tickets sales increased. In 1999, the circus was featured on an HBO special, which was nominated for an Emmy award, and the circus finally became profitable. Then and now the UniverSoul Circus continues to amaze audiences. According to Walker, “It is a circus that revolves around our culture. It has always been popular. We have a unique blend of urban music, dance and theater. No one in the world has what America developed through its urban cities.” Walker recruits performers from around the globe including Africa, South America and Europe. He provides artists with extensive training and then frames their acts in the urban culture. Hiring individuals with enormous talent and shaping them into exceptional performers is something Walker learned from his time with Motown. A few years ago, Walker developed a program for at-risk kids that today is called “Lives Matter”. It objective was to help to provide kids with inspiration. “It is exposure really.” said Walker. “Growing up within those 4 city blocks you are limited to what you see around you and you form your life around it. The minute I was exposed to something different my life changed.” An important part of the special show is a presentation from an kid who has achieved some success. After all, those many years ago it was the comment from an ambitious peer that had such an impact on Walker. “That moment changed my life. A parent or adult couldn’t have done it." Seeing a glimpse of the ambition and perseverance of a peer, is what sent Walker on the path towards success. He hopes that he can do that for other young people. The end of summer does not have to mean the end of fun in the Triangle. There are two upcoming festivals where you can experience African American music, art, food and culture. On Labor Day weekend the African American Cultural Festival of Raleigh and Wake County will celebrate its 5th Anniversary. This two day event takes place along Fayetteville Street in Downtown Raleigh. At the Cultural Festival, you can listen to a diverse mix of performers including the Taste of Honey featuring Janice Marie, Zap, the Bar-Kays and much more. You can view an African dance performance. Take your children to the Family Village where they can hear a storyteller or make a craft. Then enjoy a tasty treat or purchase a unique item from a vendor. Michelle Davis Petelinz, Art Program Director encourages art lovers to “stop in to each booth to meet the artists, learn about the inspiration and stories behind their work, and find a treasured piece for (their) collections.” People of all ages, tastes and interests will find something to enjoy at the African American Cultural Festival. For more information, visit www.aacfralwake.org. On September 5-6, the Durham Blues Festival will showcase the rich diversity of blues music by presenting local, national and international artists. The Blues Festival will also honor North Carolina's musical roots which include blues, jazz and R&B. The Blues festival will open on Friday evening with a reading of the poem "The Blues Traveler" by award-winning poet Dasan Ahanu. The Campbell Brothers will play a new interpretation of John Coltrane's “A Love Supreme” in honor of the 50th anniversary of the recording. Other festival performers include John Dee Holeman, Grady Champion, Kermit Ruffins, Shemekia Copeland, Calvin Edwards Trio, the Red Dirt Revelators and more. Saturday’s performances at the Durham Bulls Athletic Park will feature the International Blues Artist Winner, the Orie Naftlay Band. During the shows you can dance, spread a blanket or sit in the stands. You can also enjoy food or make a purchase at one of the many vendors. Each evening, the doors will open at 5 pm and the performances will be from 6 – midnight. Friday night advanced tickets are $35. Saturday night advanced tickets are $45. To purchase tickets, visit www.hayti.org. Both the African American Cultural Festival of Raleigh and Wake County and the Durham Blues Festival offer a variety of world class performances and events. They are reason enough to celebrate the end of summer. Sherri Holmes is the Director of the Triangle Friends of African American Arts. She can be reached at sholmes@trianglefaaa.com.